Revived show Fuller House, a Netflix original production, was the most in-demand digital original in the US last week - Parrot Analytics reveals exclusively with the DEG. In an industry first, the DEG and Parrot Analytics have partnered exclusively to deliver the top most in-demand cross-platform television shows in the U.S. every week. This enables the TV industry to compare network, cable, and OTT-original shows on the same measurement scale for the very first time. 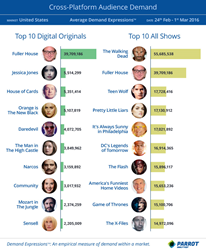 As part of last week’s top 10 list, Fuller House, a recent revival and original series by Netflix, had more than 7 times the Demand Expressions™ of the next most in demand digital original show, Jessica Jones (also a Netflix original), and outperformed many of the most popular digital original titles across Amazon and Yahoo!. Consumers express their demand for shows through various ‘demand expression platforms’ including social media & photo sharing platforms such as Facebook and Instagram, blogging and microblogging platforms such as Tumblr, wikis and informational sites, peer-to-peer protocols and file sharing platforms. Harnessing the power of cutting-edge artificial intelligence and hundreds of billions of data points across the various demand expression platforms, Parrot Analytics is able to combine the different methods consumers use to express their demand for content into the industry’s first and only cross-platform global content demand rating system. Demand for a show is measured by Parrot’s Demand Expressions™ – are a country-specific measure of the overall demand being expressed for a title in a given market. It is designed to enable the comparison of the audience demand for content in the same market – regardless of which platform the content airs on. Netflix titles, led by Fuller House, dominate the top 10 list: seven out of the 10 are Netflix titles, including all of the top five. Out of the digital original series, Fuller House is in a class of its own, with between 7 and 18 times more demand than the other titles in the top 10. While the megahit The Walking Dead has about 1.4 times the demand of Fuller House, Fuller House has over twice the demand of the third most in-demand title this week, Teen Wolf. Fuller House was also the only digital original series in the top 10 overall titles last week. The fact remains that post its full season release on Netflix, Fuller House was the most in-demand digital series as well as the second most in-demand series overall amongst U.S. audiences last week. Parrot Analytics is a data science company that empowers media companies, brands and agencies to understand global audience demand for television content. Wielding the world’s largest audience behavior data sets, the company has developed the world’s only global cross-platform, country-specific audience demand measurement system. Parrot Analytics captures an unprecedented spectrum of actual audience behavior including video streaming consumption, social media, blogging platforms, file-sharing and peer-to-peer consumption spanning 249 countries. This enables media companies, for the very first time, to understand audience demand for content across all content distribution platforms in all markets around the world. The DEG advocates and promotes entertainment platforms, products and distribution channels which support the movie, television, music, consumer electronics and IT industries. DEG membership is comprised of: Akamai, Alchemy, Amazon, Anchor Bay Entertainment, BBC AMERICA, bitMAX, BluFocus, CenturyLink, Cinedigm Entertainment, Comcast, comScore, ContentBridge, Cryptography Research, DTS Listen, Deloitte, Deluxe Digital, DirecTV, Dolby Laboratories, DreamWorks Animation, Giraffic Technologies, GfK Entertainment, Gibson Brands, Google play, HBO Home Entertainment, Houghton Mifflin Harcourt, IHS, IMAX, Intel, Kaleidescape, LG Electronics USA, Lionsgate, MAI, Mediamorph, MGM, Microsoft, Midnight Oil, MovieLabs, Music Watch Inc., My Eye Media, Neustar Media, Nielsen Entertainment, NPD Group, One+K, Outpost Media, Panasonic, Paramount Home Media Distribution, Parrot Analytics, PBS Distribution, Philips Electronics, Playster, PricewaterhouseCoopers, RLJ Entertainment, Random Media, Redbox, Rovi, Samsung Electronics, Screen Engine/ASI, ScreenPlay, SellThruCo, Sony DADC, Sony Electronics, Sony Music Entertainment, Sony Pictures Home Entertainment, Technicolor, The Orchard, TiVo, Twentieth Century Fox Home Entertainment, Universal Music Group, Universal Operations Group, Universal Pictures Home Entertainment, V2Solutions, Verizon Digital Media Services, Vubiquity, W2O Group, Walt Disney Studios, Warner Bros. Home Entertainment, Warner Music Group, and Western Digital.